On Sept. 18, Gov. 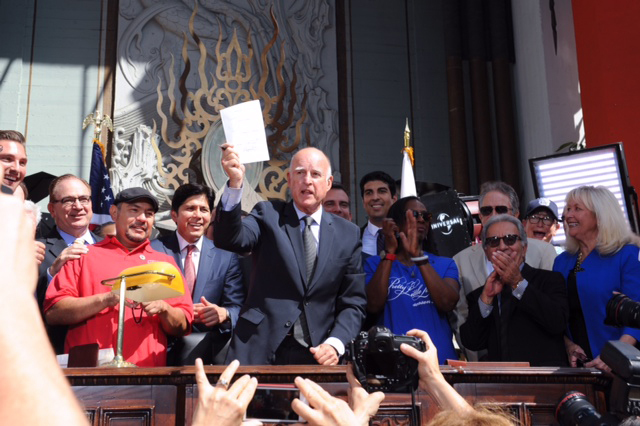 Jerry Brown signed into law AB 1839, a bill that strengthens our state’s film and TV tax credit program to bring more entertainment jobs back to California. This effort has been years in the making. Local 47 and the Recording Musicians Association of Los Angeles worked closely with SAG-AFTRA, IATSE, Teamsters, DGA and others to form a coalition to lobby and pass this important legislation. The California Film & Television Production Alliance — a coalition of guilds, unions, producers, small businesses, studios, and associations throughout the state that have worked together for more than a decade to promote, improve, and enhance film and television production in the state of California — commend the governor and a band of state legislators who helped push the expansion, extension and improvement of California’s film and television production incentive program. The legislation boosts the existing program’s $100-million cap to $330 million per year for five years, more than tripling the current annual allocation, beginning fiscal year 2015–16. It also replaces the current flawed and arbitrary lottery system with a more competitive and accountable system that ranks applicants according to net new jobs created and overall positive economic impacts for the entire state. Musicians are happy about language included in the legislation that will increase the credit for qualified expenditures relating to music scoring and music track recording. Further, the bill will urge Congress and the International Trade Commission to investigate aggressively and impose sanctions and tariffs on elements of production, including music scoring, visual effects and virtual photography, protected by the Tariff Act, to combat unfair and illegal competition from international parties. The expansion California’s tax incentive program is supported by Listen Up!, a national campaign of the American Federation of Musicians of the United States and Canada endorsed by Los Angeles mayor Eric Garcetti that works to combat the outsourcing of film music jobs from North America. “We must act to ensure musicians’ work is valued by all companies at the same professional standard as other cast and crew, and the passage of AB 1839 will greatly aid in this pursuit,” said AFM President Ray Hair. This entry was posted in All News and tagged AB 1839, Tax Credits on October 10, 2014 by admin.